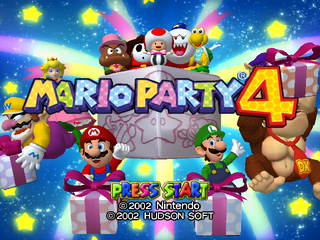 Mario Party 4 is the first GameCube Mario Party game. The first of four. Other than getting a big graphical upgrade, it's pretty much the same game as the first three. Replace filesel.bin (data Folder) and fileeseldll.rel (dll folder) with E3Setup.bin, and E3SetupDLL.rel to replace the main game menu with an earlier one seen at E3, or alternatively use the Gecko code 04130030 8012F7B5 (NTSC-U). Interestingly, Donkey Kong and Wario can't be selected on this menu, presumably because their characters weren't done in time for E3. 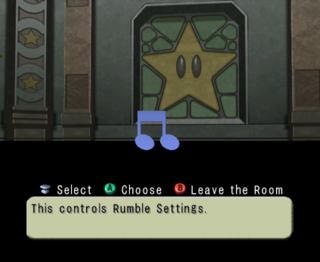 "Vivration" changes the Rumble setting. "Board" leads to a choice between Toad's Midway Madness and Goomba's Greedy Gala. As soon as the game starts in Board mode, the game goes straight to the "Last 5 Turns" screen. After that, the game will continue like normal. Unlike "Mini-Game" mode, there are explanation screens when the game starts the mini-games. 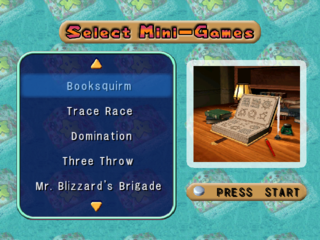 "Mini-Game" gives a list of mini-games to play. These mini-games boot up without explanation screens. Once a game is finished, the player is booted back to the menu. Replace w01.bin (data folder) and w01Dll.rel (dll folder) with selmenu.bin and selmenuDll.rel or use Gecko Code 0412FEC8 8012FB2E (PAL) or 041300A8 8012FD0E (NTSC-U). 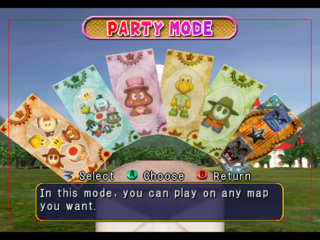 Start a new Party Mode game and select Toad's Midway Madness as the board. Once the game starts, you should boot into a debug menu! 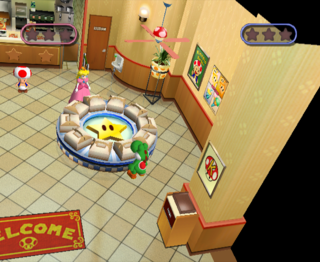 This is setup very similar to the Nintendo 64 Mario Party games, but this one doesn't have a cool background. 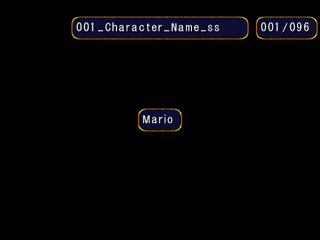 Before a mini-game is played, this rudimentary character select screen appears. 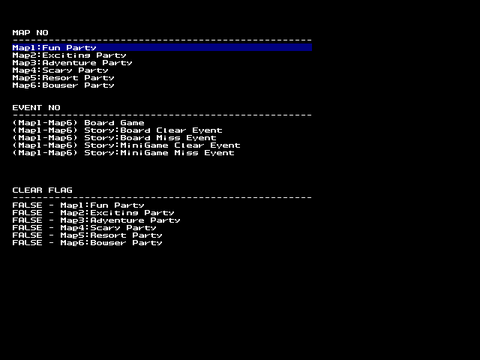 There are two special options in this menu: "MESS CHECK" and "STORY TEST"
A test of the cutscenes on each board. A Button: Choose selected option. B Button: Go to previous set of choices. Press the A Button on the clear flags menu to play the scene. Miscellaneous debug materials not accessible through the debug menu, but instead have to be accessed through hacking devices to see. A panned view of the area. Use the Gecko Code 041300B8 8012FC2A (NTSC-U) or 0412FE50 8012FA4A (PAL) and start Shy Guy's Jungle Jam to be sent into this screen. This screen tests minigame start and end animations. 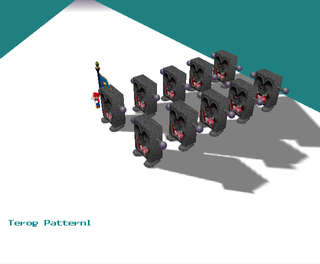 The area contains Mario looking around, a constantly moving flag with a ring of flames underneath the ground surrounding it, and 10 Whomps. The A Button does the "Draw!" animation, the B Button does the "Start!" animation, the X Button changes which "Start!" animation plays with 7 animations total, the Y Button does the "New Record!" animation with a time of 0'00"98, Start stops all animation and any input besides itself, The L & R Buttons zoom in and zoom out respectively, the Analog stick rotates the camera, the C-Stick moves the camera, and the rest of the buttons don't do anything. The memory usage meter from the N64 games is back with minor changes. Use the Gecko code 0402FB80 60000000 (NTSC-U) will activate it. The box is now quite a bit smaller. Enter the Gecko code 0400B258 60000000 (NTSC) and you will see the screen surrounded by red borders which specify the region of the screen that is safe for UI elements to use. The borders specify that within 16 pixels from the horizontal edges and within 40 pixels of the vertical edges are not safe to use. 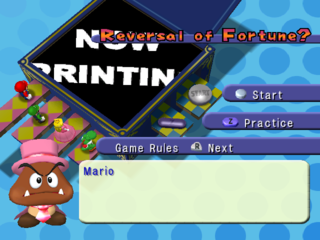 The Reversal of Fortune has an explanation screen that is never seen due to be directly loaded while in a board. 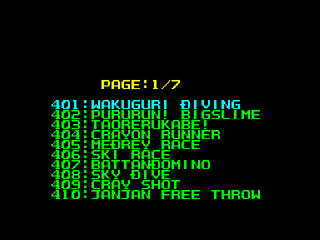 The code 00131CBA 00000000 (NTSC-U) will add the minigame to the 4-player minigames list. 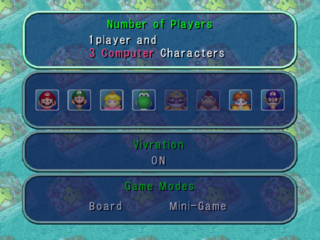 Both Controls Explanation 2 and Game Rules show "Mario". In the Order Up mini-game, in all versions of the game there is a poster with the caption 'Kinopio Burger'. As Kinopio is Toad's Japanese name, this is a detail that was overlooked during localization. 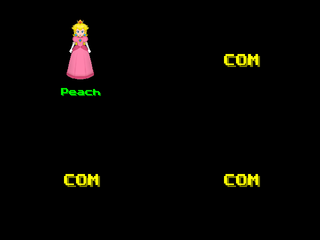 Some details which are technically used, but never visible to the player. In the center of the Options Room is a note which flashes multiple colors. 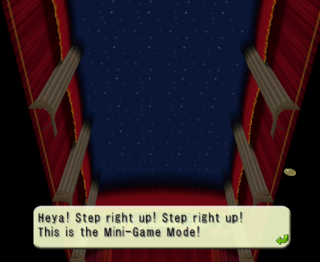 The small room that you appear in after selecting a mode has a starry ceiling. In the Order Up mini-game, there's a poster hidden off to the right which is a mushroom with "K" on it. This page was last modified on 8 May 2018, at 11:42.